Please Note: Meeting information can be found on the Program of Events page. Who could have imagined that JASNA-Eastern Pennsylvania would ever be an exhibitor in the Philadelphia International Flower Show? The opportunity presented itself to board members in the fall of 2012, and they readily approved the project. With stalwart and dedicated volunteers, the Region's exhibit was shown to advantage in the "Entryway Gardens" class. Friday's judges awarded the exhibit Honorable Mention and a Class Commendation, an award given when judges believe that all exhibits in the class are exceptional. Wednesday's judges awarded the exhibit Second Prize and a Class Commendation. View photographs of the exhibit on the regional FB page. Janeites who are "very good walkers" will want to learn about Letterboxing. There is a series of Jane Austen Letterbox adventures located in the regional area. Hint: Search for boxes in Pennsylvania placed by "Clueless." Through Dr. Janine Barchas, a breakout speaker at teh 2009 AGM, members became aware of Wentworth Castle, built in 1730 by Thomas Wentworth. Plans for Jane Austen Day 2014 began even before Jane Austen Day 2012 was at an end. Mark your calendar for April 26, 2014, when three wonderful speakers, Dr. Janine Barchas, Dr. Michael Gamer, and Dr. Joceyln Harris, will discuss The Watsons, Sanditon, and the direction Jane Austen's life might have taken had it not been cut short. The all-day event will be held in Philadelphia, and the theme will be "The Unfinished Jane Austen." Learn additional details by becoming a FB fan, following Twitter, or visiting the Jane Austen Day page. "Inquiries and communications . . . "
are now conducted electronically by the Region. Surely, Jane Austen would make use of email and Facebookor would, at least, make satirical statements about their use. Be sure to visit and LIKE the Region's FB fan page, where meeting reminders and interesting news items are posted on an almost daily basis. Student members are encouraged to email photos of themselves with Jane Austen to be added to the "Jane Austen & I" album. You can search for Janeites@jasnaeastpa or connect with us even more easily. 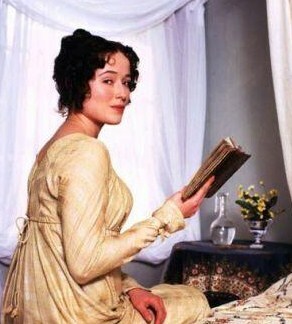 This may be the only occasion when Jane Austen would encourage someone to become a follower. "I have been watching them." On YouTube. The Region created a series of videos to promote Jane Austen Day 2012 and posted them on its YouTube channel. The videos were created by Zach Phillips of the Kitchen studio under the direction of board members Kim Kurz, Marietta Rizzone, Paul Savidge, and Elizabeth Steele. The Video Committee would like to thank Paul Savidge who chaired the committee and showed a generosity of spirit seldom surpassed. Catherine Slaymaker, region member since 2005, portrayed Elizabeth Bennet with “a mixture of sweetness and archness in her manner.” JASNA-Eastern Pennsylvania would like to thank the staff of None Such Farm Market in Buckingham, Pennsylvania, particularly George Berbaum and Karen Yerkes, and Region member Dan Macey for providing a delicious repast on the day of the shoot. Villa Maria Academy was the site of the Region's first Student Workshop program. Volunteers from the region treated the students to snacks, gifts, and a Jane Austen program of "Pride and Prejudice: Book vs. Movie." Student volunteers read from the novel, and corresponding scenes from four versions of the movies and television series were shown. Thoughtful comments on the part of the students led to an interesting and entertaining afternoon. If you are a regional high school student, JASNA member or no, who would like JASNA-Eastern Pennsylvania to hold a student workshop at your school, contact the Regional Coordinator. Would you like to attend this year's Annual General Meeting? You can, if you win first prize in JASNA's student essay contest. JASNA has posted this year's essay question, as well as information about submission rules and the wonderful prizes. JASNA’s Fifth and 31st AGMs were held in Philadelphia. Learn more about the first Philadelphia AGM and the most recent AGM hosted by the region. Members wonder if another AGM is in the Region's future.